I love decorating my entryway table and with Halloween approaching, I've been getting into the Halloween frenzy. I started with my doorway and did a Halloween Witch Wreath and now for my entryway table, there's this Spooky Halloween Bouquet. There's something to be said about Halloween, it's not just for the kids, and it's not just about the candy. I love decorating my home for the holidays, whether it's with store bought items or items that I've made myself, I like getting into the spirit of the holidays. I also love flowers, I just can't keep them alive. My friends and family would say that I have a black thumb, unlike my parents who could probably grow a vegetable garden in the desert. I love seeing flowers on my entryway table, so when I was at my local dollar store picking up supplies for crafting, I came upon these impressive floral bushes. 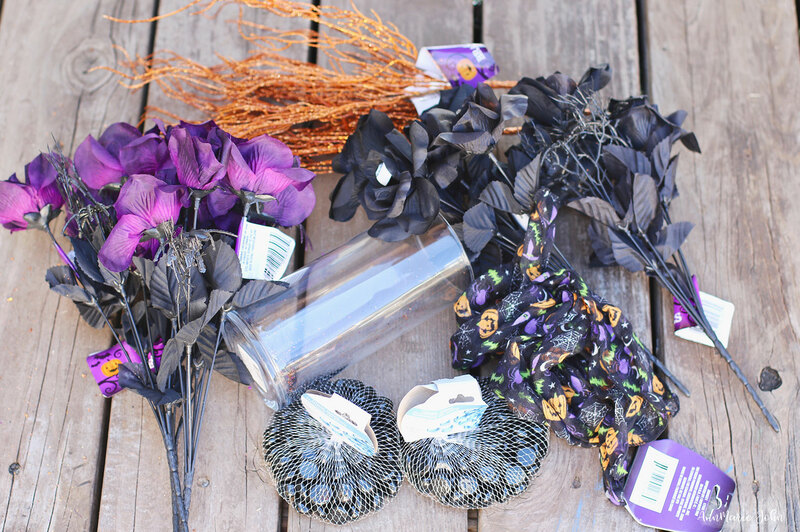 The black and purple roses were just what I needed for a spooky bouquet and brownie points for the black roses having eyeballs and spiders already attached. I knew exactly what I wanted to make and picked up my supplies. I even surprised myself when it was all finished by how breathtaking it looked. So let's get into how it's all done. This took about 5 minutes from start to finish, but only because I wanted it to look perfect. Step 1. 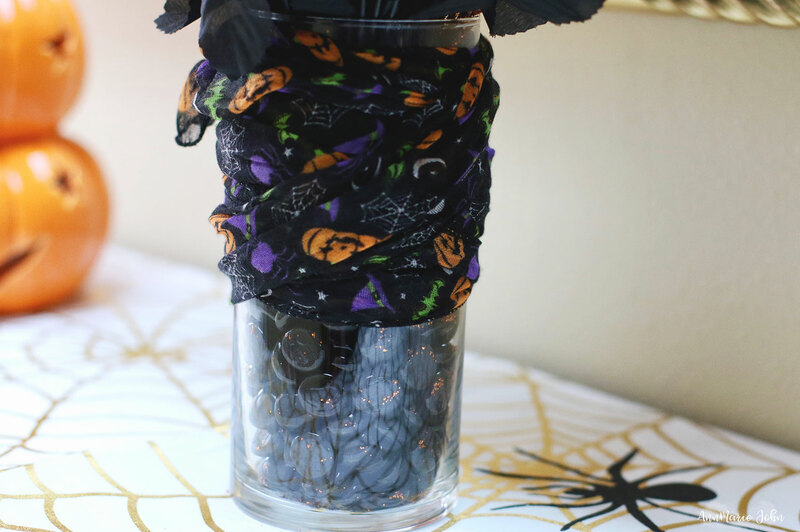 Start by filling your vase halfway with your black marbles, then wrap your Halloween scarf around the top of the vase. This will hide the stems of your flowers and the fact that the marble isn't at the top. Step 2. Insert your floral bushes, branches and the skeleton arms into the vase and position them the way you would like them to be. 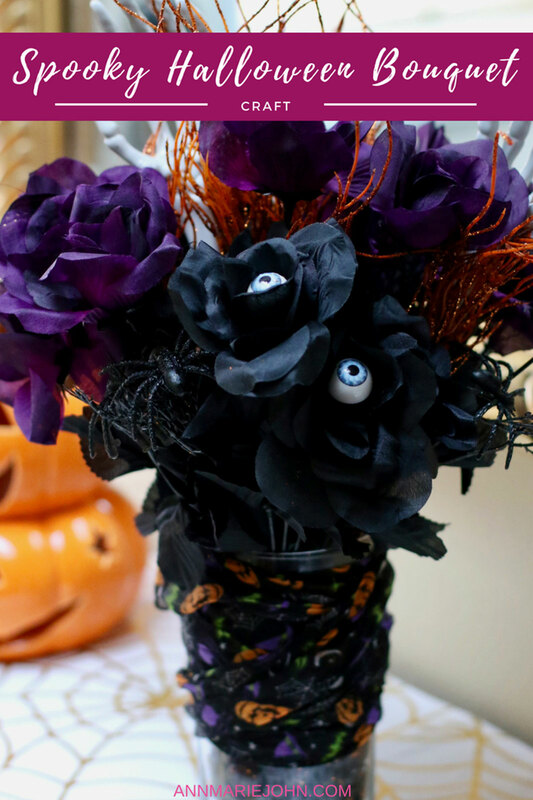 *If you were not able to find bushes with the eyeballs and spiders attached, you can use a glue gun and attach the eyeballs to the center of your flowers, and the spiders along the leaves. Place your arrangement wherever your heart desire and display it's spookiness. That is such a great bouquet! I really love the eyeballs at the center of the flowers. That's a nice touch! We loooove Halloween and set aside a day to celebrate always. You have a talent here! This is cute! Love Halloween and this looks simple and easy to do! So cute! Oh, I love this! It's going to make the perfect centerpiece for our Halloween party this year! That turned out perfect. I love the touch of the eyeballs in the center of the flowers - that was genius. OMG I totally need to make this and send it to a friend. I love the eyeballs and this is so up her alley!! I love the eyeball touch! Makes it extra festive. I spent like two hours in the fall decor section at Hobby Lobby the other day. Happy AUTUMN! This bouquet is so beautiful! I love all the colors they are so festive and scream Halloween! I am definitely going to try and make my own! 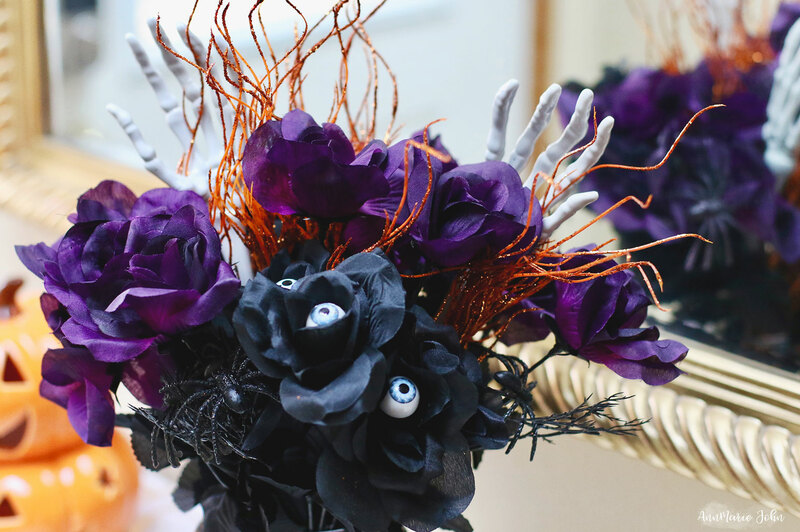 I love this Halloween arrangement...the eyeballs and spider are so quirky and fun! Seriously, this is amazing! I love decorating for the season, it makes everything more exciting and fun. It's awesome that this only took 5 minutes and the best part is that it's not expensive at all! How awesome is that! Another amazing Halloween craft! I really like the tucked in eyeballs. So creepy! I've always thought about making these, but I just didn't know where to start. I love how you added the eyeballs. Too cute! The eyeballs in the bouquet is the best! Love it! This is such a fun craft idea! I am going to pin this and my daughter and I will make it for Halloweend! This is such a fun idea and looks great! I would never have thought of this myself, but I definitely want to put something together myself for Halloween. Such a fun craft and easy to do. I will try to recreate this at home. I will have to get some materials though. Thanks for the idea. 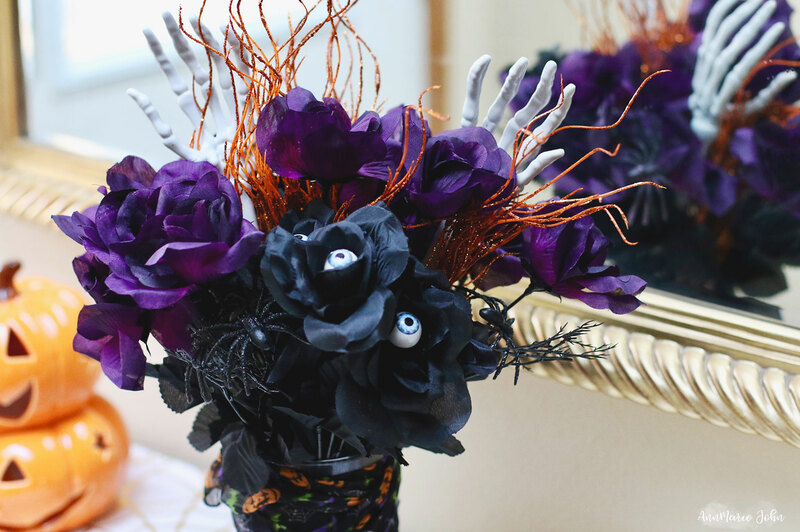 This spooky bouquet is perfect for Halloween. Thanks for sharing this post. This would be such a cute and easy decoration. I love stuff like this to be able to make with the kids. What a great bouquet! One of my favorite color combinations for Halloween is orange & purple and I love how you combined them! So beautiful! The colors are perfect. That dark purple goes perfect with the orange branches. The scarf is the icing on the cake. So cool! Pinning for later! Beautiful and creative. I love how the colors work so well together.